Do you think sharing a 50th birthday poem is a good idea? I think it's a GREAT idea. Last year, I gave "Over The Hill" to my mother. She absolutely loved it. She framed the 50th birthday poem and proudly placed it on her wall. I just changed children’s taxi service to grandchildren's taxi service in the second stanza. You're probably looking for a funny birthday poem? Am I right? 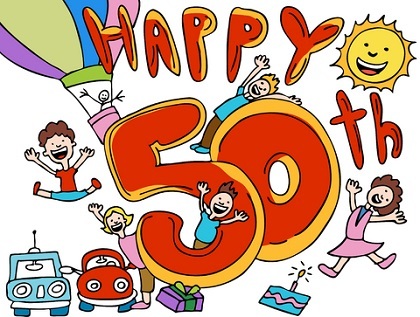 A 50th birthday funny poem that will generate laughter and smiles. With humble honesty, you will glow. Same as waistline, that is kind. Don't need to follow the herds. Learned to pick, the right forbids. Born and raised, many ages ago. Mirror succeeded, only one civilian. Trade it for your aging brain. All those discounted, subway passes. If you count, I won’t stay awake. If you forget, I’ll try to remind. Unfortunately, they don’t have a cure. To hold all those candles I'm going to be fifty! As you pass another bright sign. The year that's coming is full of joy. All the times you've been blessed. Trust us mum, we'll never let you stumble or cry. I'm sure it'll be worth the wait. A little tune-up, minor repair. For your health, eat plenty of fish. So many chapters, you have turned. Try to relax, fight off despair. Underneath that grin, I still see a flame. To celebrate your 50th birthday, my dear. I will always cherish; our dances in the rain. I feel so empty and sad, in my heart. With you by my side, I feel so free.